Ten Speed Press, 9781580082778, 256pp. HEIDI SWANSON'S approach to cooking whole, natural foods has earned her a global readership. From her Northern California kitchen, she introduced us to a less-processed world of cooking and eating through her award-winning blog, 101 Cookbooks, and in her James Beard Award–nominated cookbook, Super Natural Cooking, she taught us how to expand our pantries and integrate nutrient-rich superfoods into our diets. Writer, photographer, and designer HEIDI SWANSON is the creator of 101 Cookbooks, the award-winning culinary blog and recipe journal. She is also the author of Cook 1.0 and Super Natural Cooking. Her work has appeared in Food & Wine, Saveur, Glamour, the Washington Post, Time, Fast Company, Utne Reader, and the Vegetarian Times, as well as on Salon.com and NPR.com. Heidi lives, cooks, and writes in San Francisco. Visit www.101cookbooks.com and www.heidiswanson.com. "Every Day Maybe, But Hardly Everyday...an unexpected winner in the weeknight-warrior category." "Lovers of whole grains, local produce and farm fresh eggs, listen up. (Here's looking at you, Northern California.) 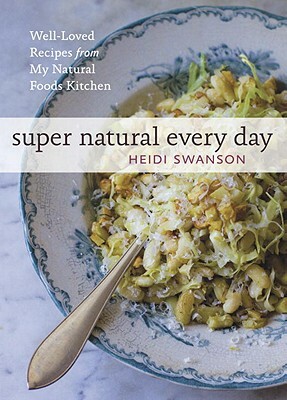 San Franciscan Heidi Swanson - of the acclaimed blog 101 Cookbooks and 2007 James Beard Award-nominated "Super Natural Cooking" - has brought us "Super Natural Every Day: Well-Loved Recipes From My Natural Foods Kitchen," a paean to natural foods." "It's an inspiring book, and one that I'm cooking out of quite a bit. If you love grains, noodles, and fresh vegetables, as well as Heidi's famous and lovely blog, do check this out. You won't regret it." "Whether you’re a vegetarian, a “Meatless Monday” convert or just trying to eat more healthy, wholesome foods, Heidi’s recipes will be valuable additions to your every day meals." "The author of Super Natural Cooking and the blog 101 Cookbooks, Swanson offers a glimpse into her favorite everyday recipes. A huge and often preachy proponent of the buy organic/local/seasonal movement, she focuses on whole, natural foods including whole grains, whole grain flours, and fresh produce--ingredients that are seasonal and minimally processed. Recipes run the gamut from breakfast through desserts and include healthier variations of familiar favorites including crepes made with rye flour and ginger cookies with dried apricots and shaved chocolate. Lunch offerings include unique and palatable dishes such as kale salad with toasted coconut and sesame oil, and chanterelle tacos. Dinner recipes such as chickpea stew made with saffron, black pepper tempeh and weeknight curry made with tofu are big on flavor. Swanson spends several pages detailing her pantry staples including oils and fats, grains, and flours to guide those unfamiliar with key ingredients. For those looking to incorporate more healthful ingredients into their diet, Swanson offers a welcome variety of appetizing recipes that are easy enough to prepare on busy weeknights and sure to appeal. (Apr.)"